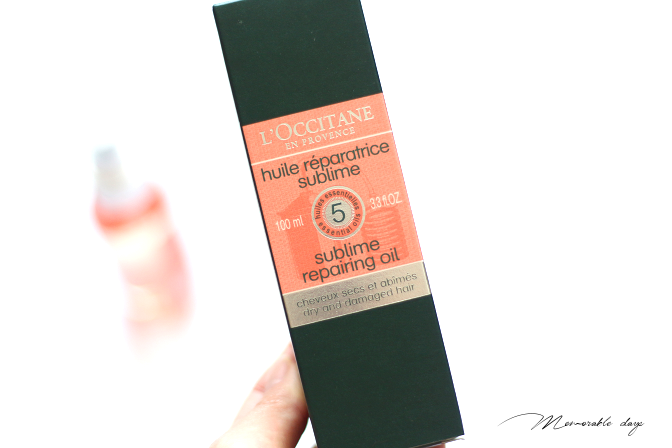 Review: L'Occitane Sublime Repairing Oil | Memorable Days : Beauty Blog - Korean Beauty, European, American Product Reviews. I have been dyeing my hair for years and I sometimes wish it looked healthier. L'Occitane created a new product to solve this problem. 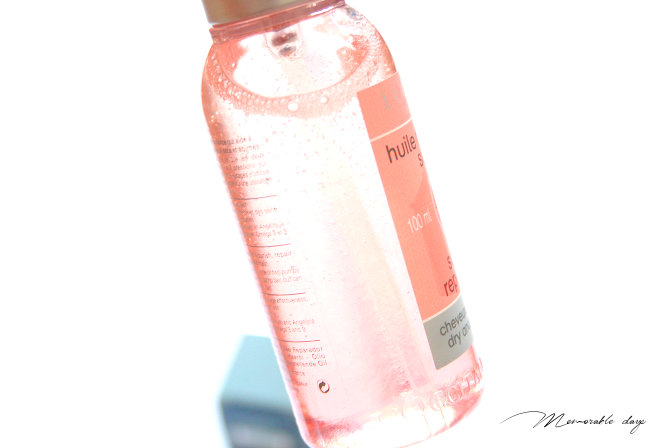 They created the sublime repairing oil that creates shine, helps to nourish, protect dry and damaged hair. It sounds promising and just what my hair needs. In today's blogpost I am sharing my thoughts about it. 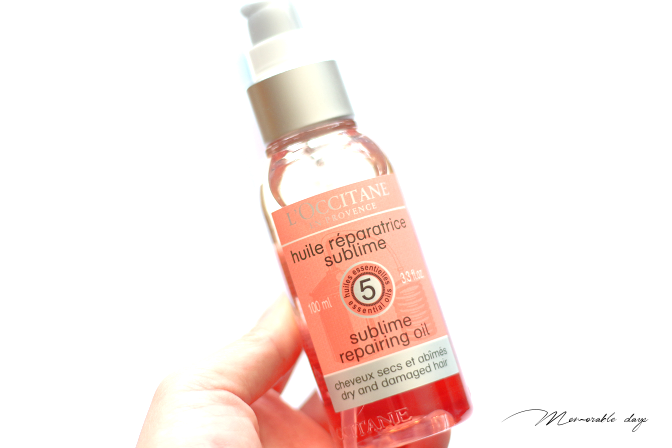 The Sublime Repairing Oil is a treatment that reveals shine and helps to nourish, repair and protect dry and damaged hair. It contains 98% natural origin ingredients; five essential oils (Angelica, Lavender, geranium, Ylang-Ylang, sweet orange) and plant-derived amino acids. 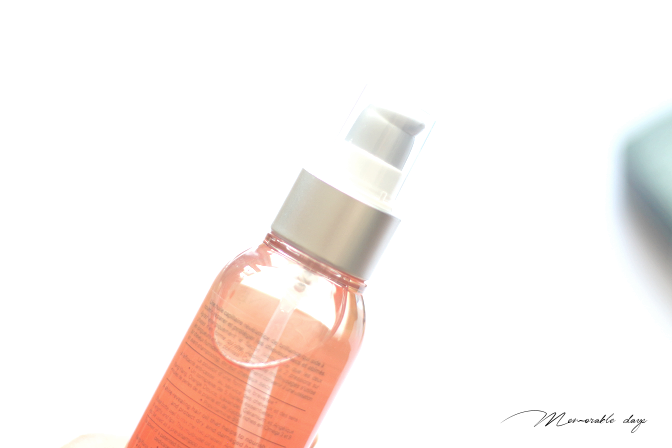 After application is will look smoother, more nourished and maintains more natural shine. 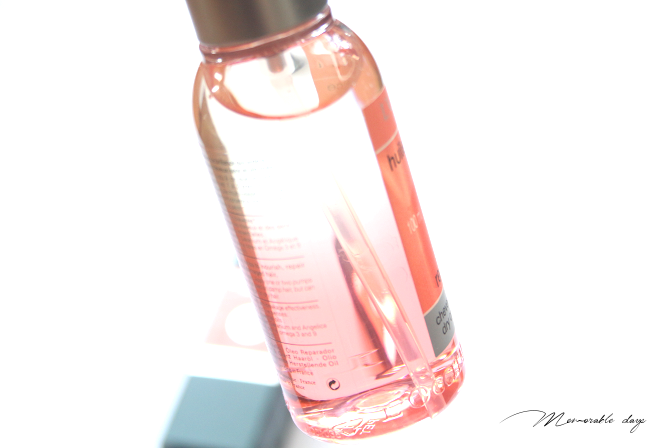 It contains 100 ml of product. It comes in a lovely green and orange packaging. If you look in the following pictures you can see that the upper part of the formula is translucent, the lower part is orange/pink. Before you use it shake the bottle well to mix the two phases (makes me think of a cocktail lol). Apply two pumps to your lengths and tips. This oil can be used on damp hair, can also be used as a pre-shampoo care treatment or on dry hair. The lower part has a orange/pink color and is waterbased mixed with oil with provitamin B5. Because of this part the hair feels less dry and less damaged. 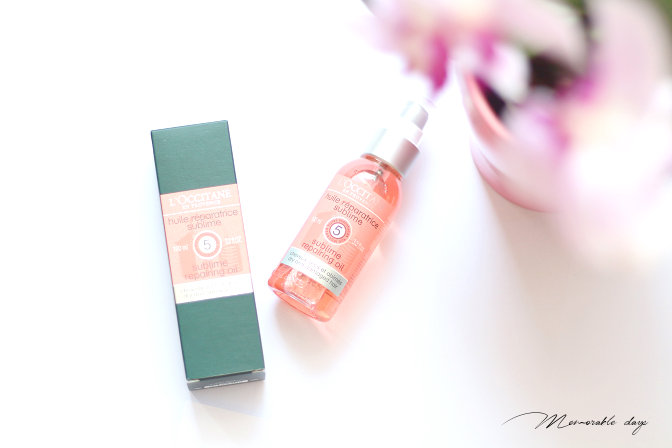 The upper part is a translucent oil which is rich in jojoba oil and meadowfoam, because of this combination it results in hair that looks smoother, more nourished and maintains more shine. This oil does have a scent to it. It smells exactly like Switsal baby oil and the scent will stay in your hair after you apply it. You either like it or not. I don't think it's overwhelming which is good. 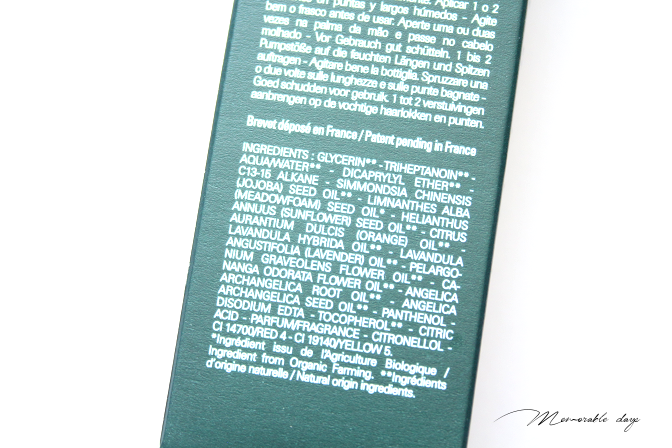 You can buy it at a L'Occitane store or online at loccitane.com, selling it for €26.-. First thing I noticed about this product is the good ingredient list that it has, it contains a lot of great oils that our hair needs. It's a good product to nourish my hair with and making it look less dry. I don't mind the scent which just smells like baby oil to me. It doesn't make my hair look greasy and it doesn't make it heavier. The oil absorbs quickly and it's easy to spread. I do doubt if it will really repair my damaged hair and it doesn't make my hair shine either, but it does moisturize it and makes it feel soft after application.